Neuronal theories of conscious access tentatively relate conscious perception to the integration and global broadcasting of information across distant cortical and thalamic areas. Experiments contrasting visible and invisible stimuli support this view and suggest that global neuronal communication may be detectable using scalp electroencephalography (EEG). However, whether global information sharing across brain areas also provides a specific signature of conscious state in awake but noncommunicating patients remains an active topic of research. We designed a novel measure termed “weighted symbolic mutual information” (wSMI) and applied it to 181 high-density EEG recordings of awake patients recovering from coma and diagnosed in various states of consciousness. The results demonstrate that this measure of information sharing systematically increases with consciousness state, particularly across distant sites. This effect sharply distinguishes patients in vegetative state (VS), minimally conscious state (MCS), and conscious state (CS) and is observed regardless of etiology and delay since insult. The present findings support distributed theories of conscious processing and open up the possibility of an automatic detection of conscious states, which may be particularly important for the diagnosis of awake but noncommunicating patients. 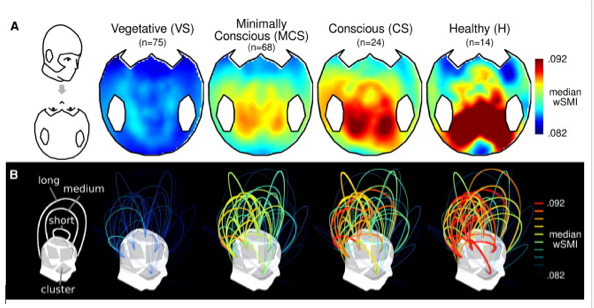 Figure - wSMI Increases with Consciousness, Primarily over Centroposterior Regions(A) The median wSMI that each EEG channel shares with all other channels is depicted for each state of consciousness. (B) 120 pairs formed by 16 clusters of EEG channels are depicted as 3D arcs whose height is proportional to the Euclidian distance separating the two clusters. Line color and thickness are proportional to the mean wSMI shared by the corresponding cluster pair. If information sharing is the signature of consciousness (whatever that is), then does that mean the act of sharing information between individuals (such as this blog post, for example) is also an expression of consciousness (whatever that is)? The definition implicit in this work seems to be consciousness as 'being aware of oneself' a subjective first person phenomenon . Such a state most likely doesn't develop in the absence of early social sharing between mother, child, others. On your sharing information comment, trying entering "extended mind" in the blog's search box.. Andy Clark and others over many years, have argued that our minds are impossible to distinguish from our social and physical environment, because they really can't exist in the absence of a cognitive coupling between the two.